When you can’t pay your bills, repossession is a real worry. If you don’t have your car, how will you be able to get to work? If you can’t get to work, this will only worsen an already bad financial situation. It’s important for you to know what repossession is, how it works, and your rights during the process. The Washington State Office of the Attorney General offers a good overview of repossession. Repossession occurs when you default on-or can’t pay-a loan. The creditor then repossesses, or takes back, the item for which you received the loan. According to the Washington attorney general, your creditor does not have to notify you before repossessing your car or other item. Your car can be towed whether it is in your driveway, a public lot, or a private lot. If it is in your driveway, however, the creditor cannot move another car. Your car cannot be towed from your garage. 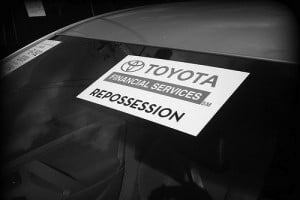 When repossessing your car, creditors are legally prohibited from committing a crime, using abusive language, entering your home without permission, or taking the car if you resist. If you’ve paid more than 60 percent of the loan, the creditor is required to sell or lease the car, unless you sign a statement allowing them to keep the car in payment of the loan. The sale must take place within 90 days of the car’s repossession, and you must be notified in advance of the date and time of the sale. However, if you’ve paid less than 60 percent, the creditor has the option to keep or sell the car. The creditor must notify you of their decision. If the creditor decides to keep the car, and you disagree with this, you can protest-in writing-and demand that the car be sold, within 21 days of the repossession. The money from the sale of the car must be used to cover the remainder of the loan as well as the costs of repossession and sale. Any money over this amount is returned to you. If the money does not cover the loan balance, the creditor can sue you for the remainder of the loan, the costs of repossession, and attorney fees. What should you do if you want your car back? Under Washington law, you have the right to get back your car after it is repossessed. The cost of getting the car back may vary, and you may be responsible for the costs of the repossession and attorney fees. If you’re having trouble paying your car loan and other bills, don’t wait until your car is repossessed to get help. Call an experienced Everett, WA bankruptcy lawyer to see how you can avoid repossession and get back on your feet.